Frame Steel tubing, closed double cradle with elastic kinematic engine mounting system to isolate vibrations. 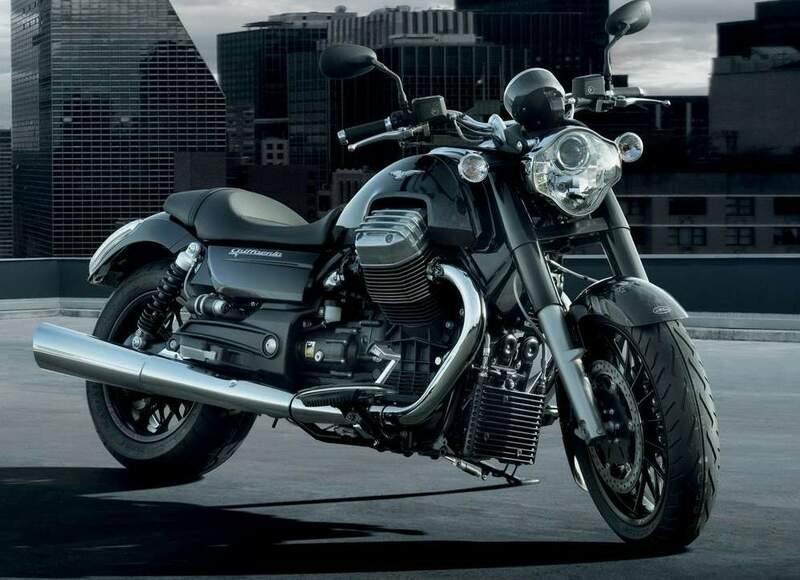 With the California 1400 project Moto Guzzi redefines the concept of the luxury bike, polarising it into two opposite personalities in style, but combined in the expression of reference technologies and performance. The emblem of a culture and capability of building unique bikes since 1921, the California 1400 Touring and Custom models are assembled by hand in the Mandello del Lario plant and, with their innovation and style, they represent the turning point in Moto Guzzi history, one of the oldest and most respected brands in motorcycle history. 1. FROM THE USA TO THE REST OF THE WORLD. 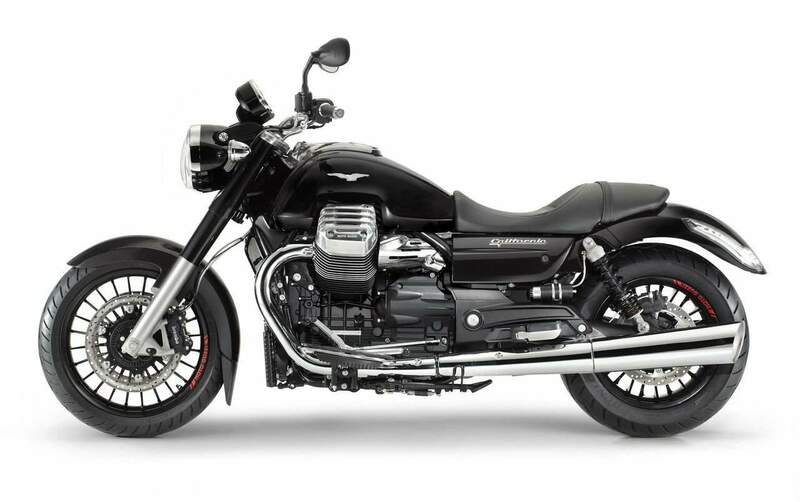 On the streets for more than forty years, the Moto Guzzi California is the most famous Italian bike in the world. Its career began in 1970 when, after a series of stringent tests, the Moto Guzzi V7 Police won the selection to enter the LAPD (Los Angeles Police Department) fleet. For the first time a foreign bike had won a contract in America to supply the Police, beating out, in addition to the national manufacturer, the best English competition. News of these stars & stripes uniformed Moto Guzzi bikes generated great interest in Europe as well, strengthening the excellent reputation that the V7 achieved with the 700 and Special versions. From the photographs of LAPD and Highway Patrol officers, however, it is clear that this Moto Guzzi V7 is decidedly different from the ones sold in dealerships: oversized saddle, bullhorn handlebars, platform footrests and an overabundance of chroming. These are elements that gave the V7 a popular Americanised style and stimulated a demand so strong that it convinced Moto Guzzi to begin factory production in 1971 with the name California. Since then seven generations and four engine capacities (750, 850, 1000, 1100) have alternated in more than one hundred thousand units manufactured: a success. 2. THE LIFE OF A STAR. Well known by all, loved by many and literally revered by long distance riders, during its forty year career the Moto Guzzi California has patrolled the American freeways, escorted monarchs and presidents and been parked in the garages of cinema divas and rock stars, becoming a reference point in motorcycle history. More than any other model manufactured at Mandello del Lario, the California represents the values and strength of the Moto Guzzi brand: style, comfort, reliability and performance. Success motivated by a rare quality: knowing how to reconcile the comfort and cargo capacity of a custom bike with the dynamic nature and performance of a powerful street bike. 3. CALIFORNIA 1400: AN EPIC TURNING POINT. The largest twin cylinder engine ever made in Europe, able to produce an explosive torque of 120 Nm at just 2750 rpm. The first custom in the world equipped with MGCT traction and multimap Ride by Wire technology, with the possibility of selecting three different power output curves: Turismo, Veloce and Pioggia. The first custom in the world with a headlight assembly equipped with LED DRL daylight running lights, like the system used on late model cars. A brand new double cradle frame equipped with an elastic support system capable of completely eliminating vibration transfer. A new cardan final drive, at the top of the category for smooth and quiet operation. Even looking closely at any other detail of the new California 1400, from the wheels to the instrument panel, from the components to the quality of the paint and the assembly, the magnitude of the change is clear: these Moto Guzzi bikes definitely represent a turning point in the brand’s history. 4. DESIGN: THE MODERN LINES OF A LEGEND. Elegant, with a spectacular visual impact, the lines of the 1400 California convey unmistakeable Moto Guzzi class and tradition combined with never before seen size and technology. Surprising in the smallest details as well as in its components, the design of the new California maintains a virtual continuity with its ancestors despite not having even one element in common with them. The stylistic hints are in the saddle profile, the chromium grab handle and the side panels inspired by the T3, as well as a size ratio between the fuel tank and engine which favours the latter, precisely like the style of the V7 and V850 ancestors. This impression is fed above all by the ingenious fuel tank, made of metal, with a 21 litre central body and two side panels, where the Eagle logo is lodged, moulded over the powerful head guards of the new 1400 cc round head engine. Nestled within the V formed by the twin cylinder engine, the fuel tank contributes to making the side view significantly lower and more slender, also due to the clear lengthening of the wheelbase which is now 1685 mm instead of the 1560 mm from the last California 90. The particular polygon shape of the headlight dominates the luxurious front end, enriched in proper California tradition by the indispensable windshield and supplementary lights. More than thirty years after the T4, lightweight alloy wheels reappear on the California 1400, now with an original ribbed design. The huge cross section of the 200/60-16 rear is striking, while the front mounts a more ordinary 130/70-18 size. The 46 mm front fork is another reflection of its glorious ancestry: completely sealed by the imposing black “telescopes”, the style replicates the units which equipped the first V7 and V850 models. The riding cockpit is a perfect example of the marriage between design and technology that brings the new California to life. The instrument panel stands out for its attractive style and visibility, enclosed in a circular panel which is an impressive 150 mm in diameter with the analogue RPM indicator scale carved out along the outside of the multifunction, suspended full matrix display at the centre. The covered handgrips are also new, as well as the bullhorn handlebar and the electric blocks where, on the right hand the rider can, for the first time on a Moto Guzzi, engage the cruise control. The history of Moto Guzzi’s California is very important to the company. Decades ago, the California gathered a large and loyal customer base with its style and touring capabilities. It was even picked up by police departments here in the United States for use in law enforcement . . . providing comfort and dependability prized by officers. Its march through the years included several changes in displacement, including 750cc, 850cc, 1000cc and the most recent 1100. 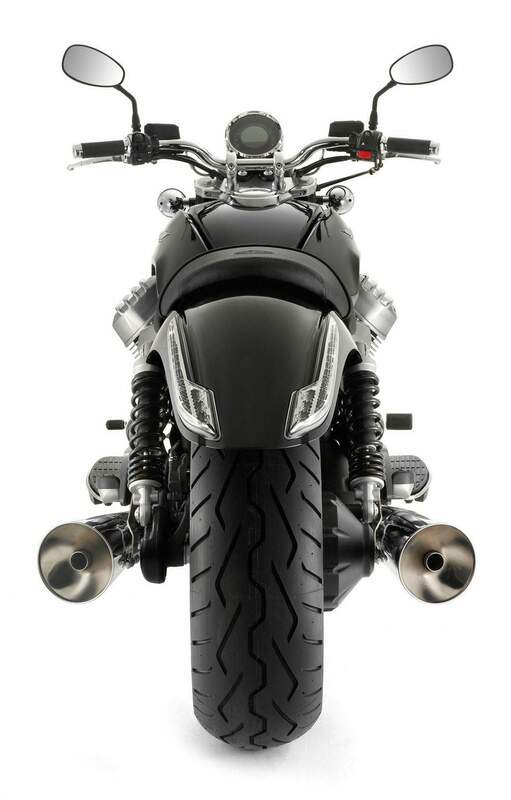 The purchase of Moto Guzzi by Piazzio presented the opportunity to thoroughly redesign, and re-engineer the California. The Piaggio Group has invested 42 millon Euros (approximately $54 million U.S.) in the development of new models and modernized production facilities for Moto Guzzi. One result of this investment is the new California 1400. With the same traditional panache sampled by riders decades ago with their open-face helmets and Ray Ban sunglasses, the new California 1400 storms forward with technology, refinement and sophistication that would be totally unrecognizable to those same riders. With the new, stiff double-cradle steel frame and “elastic” engine mounts, this new California is a smooth and friendly ride despite its huge wheelbase and roughly 710 pounds (fully fueled). 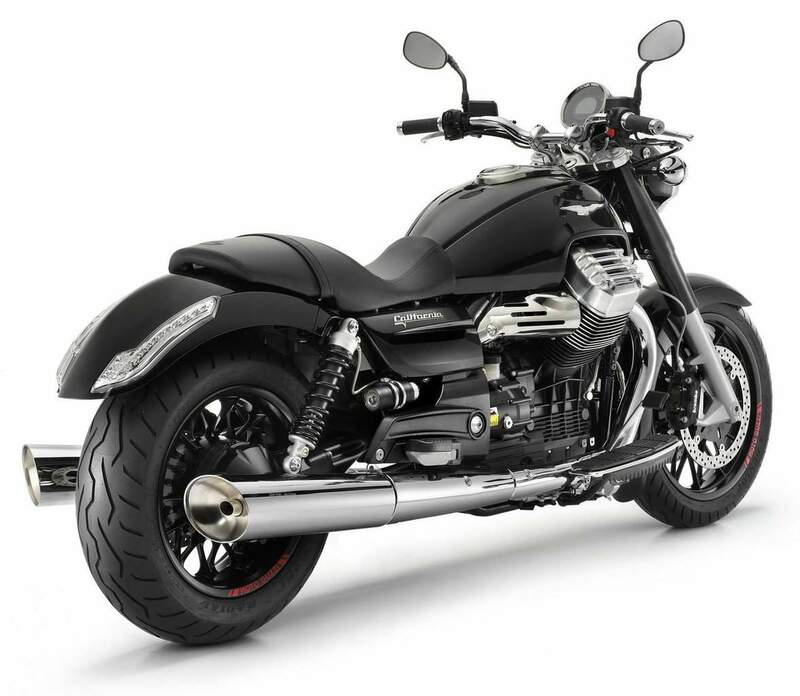 Confirming Moto Guzzi’s claims, the California 1400 proved relatively agile and very comfortable. The styling is distinctive, and highlights the trademark v-twin engine with its unique, wrap-around gas tank. The huge LED headlamp, heel-and-toe shifter and other functional-design elements, including the handlebars, large instrument panel, and fender designs, are at once a modern, high tech expression as well as a clear bow to tradition. It is not a bike that leaves the observer indifferent. The 1380cc twin is the largest v-twin manufactured in Europe. Still 90 degrees and cooled traditionally with a combination of ambient air and an oil pump system, everything else about the engine has been modernized. The electronic fuel injection system by Magneti Marelli is controlled through a ride-by-wire throttle. Three different engine maps, traction control and cruise control are also provided. Power is delivered through a six-speed transmission and a dry clutch. Given the massive displacement of this v-twin (by European standards, at least), outputting nearly 90 foot pounds of torque at just 2750 rpm, the vibration level is surprisingly low. Credit the unique engine mounting system described in detail in our earlier article. Adding to the refined feel are well tuned suspension components, adjustable only in the rear for spring preload. 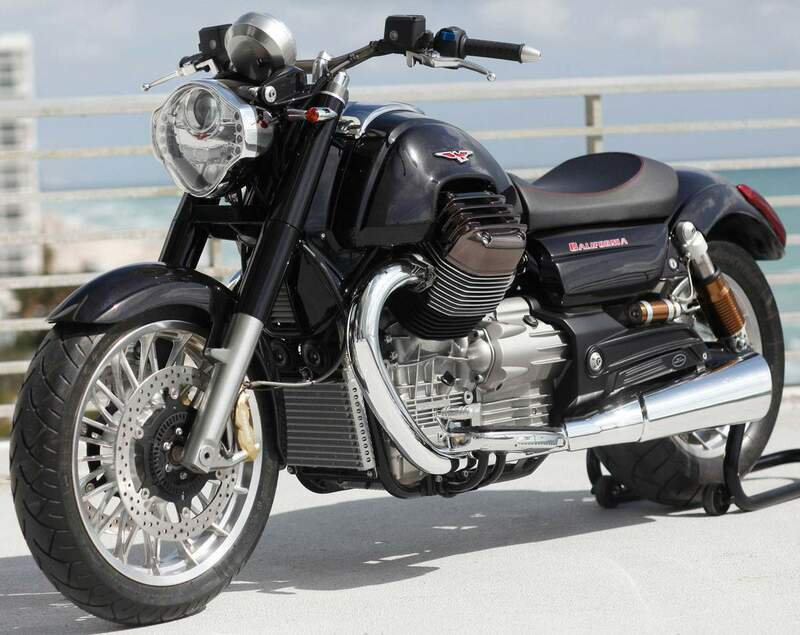 Moto Guzzi also incorporates a well-designed shaft drive system that avoids the handling quirks of older designs. The brakes are impressive. The 320mm front discs are squeezed by premium four-piston, radial mount Brembo calipers. In back is a single 282mm disc. Incorporating the latest ABS technology, the bike comes to quick and controlled stops. The choice of the spectacular 200mm wide rear tire has had no negative impact on handling. We were certainly impressed when we saw the new California 1400 in the flesh. On starting the bike, at idle, the vibration from the engine reminded us of the older model. As soon as we released the clutch and pulled away from a stop, everything changed. This is still a soulful motor, but the vibration level is so low once underway, it is unlike any previous Moto Guzzi. We were grateful for the relatively low seat height when picking this big bike off its side stand. The handlebar places the grips in a comfortable position, and the windshield offers good protection unless you are a taller rider, in which case an optional tall windshield is available. The rest of the ergonomics, including the huge platforms for your feet, are well placed and comfortable. The large instrument panel is very legible and informative (indicating fuel consumption, fuel level, gear position and just about everything else you would like to know). The three engine maps available are designated Touring, Sport and Rain. The first two offer full power, but a slightly softer delivery in Touring mode. The Rain position, understandably, reduces and significantly softens the power delivery. These options, together with traction control and ABS, provide for safe passage through challenging weather. On twisty roads, the new California 1400 was surprisingly capable. For this category of bike, it was swift and sure. Ground clearance was also better than most “cruisers” offer. 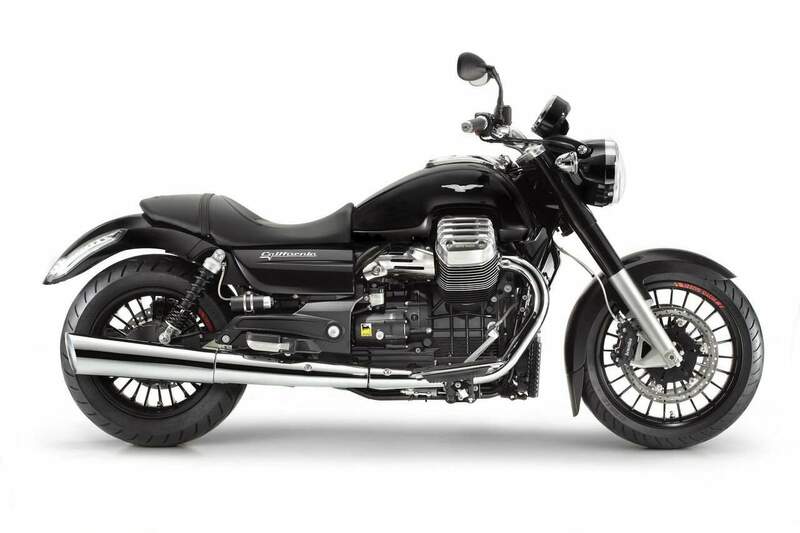 Our conclusion is that the new Moto Guzzi California 1400 offers the power, comfort, style and handling to be a serious competitor in the traditional cruiser category, while reaching beyond that category to tempt motorcyclists who simply want a comfortable, inspired ride on a classically styled machine.